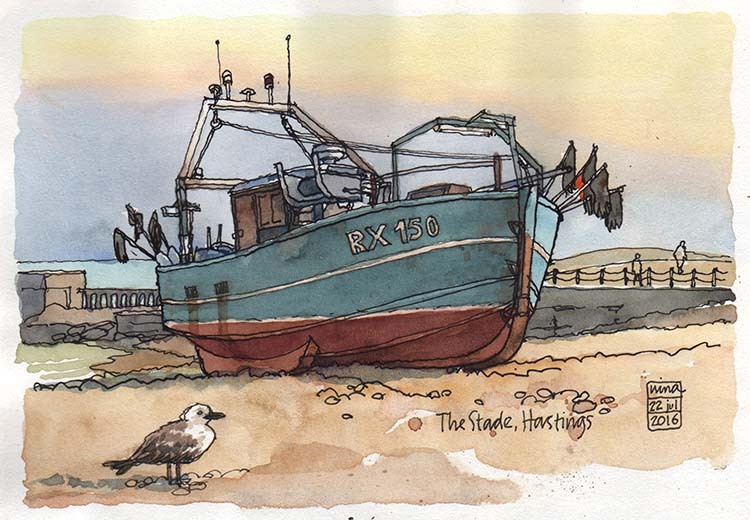 [By Nina Johansson in Hastings, England] Before the Urban Sketchers symposium in Manchester this summer, my dear M and I decided to take a look at Hastings on the South-Eastern coast of England. We had a great time revisiting places where M spent some time as a kid, and taking walks around the city center and the old town. Cornwallis street was a really fun place to sit and sketch. 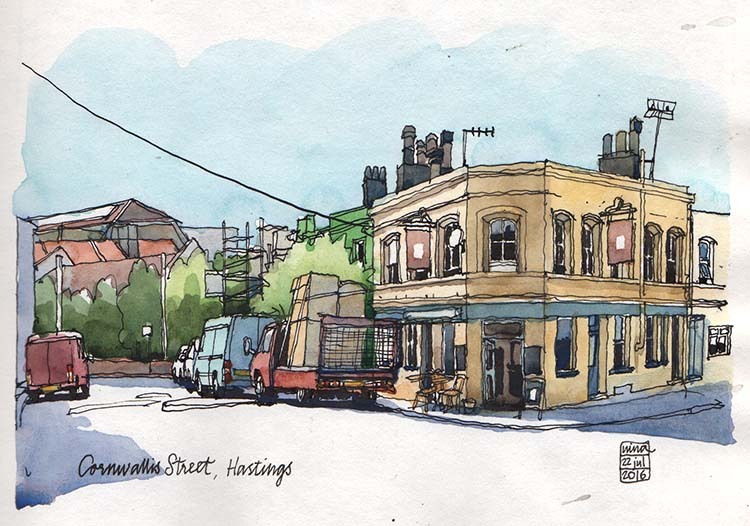 So many nice people stopped by for a chat, and since a few of them lived in the street, I got a bit of inside information about the place, along with some history lessons about Hastings in general. Too bad the red little truck parked there before I had a chance to draw the green house behind it. The colour of that house was exactly the same as I had on the walls in my childhood room. I´ve never seen it on the façade of a building. (Actually not in any other kids´ rooms either.) The guy who owned the house came by, and told me that quakers built it back in the 1860´s. I was a bit blown away by the Stade, the beach where the fishing boats are launching and landing directly from the beach, with the help of tractors and winches. I could have spent a week drawing only on this beach – so many interesting things there!